I know a lot of you have been hoping for updates, but the fact is between keeping Tristan busy and soaking up every second with Tyler I haven't felt like it. On Monday, Tyler, Tristan and I drove to Morgantown. We stopped in Flatwoods at an awesome antique mall. When we go to Morgantown, I took Tyler straight to the armory then went and checked into the hotel. Tristan and I went to a bookstore and killed time until we had to pick up Tyler. Tuesday, I went to the Morgantown mall with Tristan. We hung out there until we had to pick up Tyler. Wednesday was a busy day. It was Family Day at the armory so Tristan and I went to spend time with his daddy. If he were a bit older he would have had a lot of fun since they had inflatables and crafts. There was food, but the line was so long that by the time Tyler and I got in it they had run out. 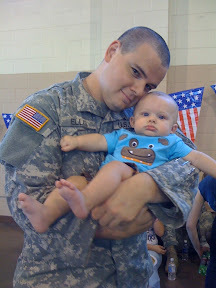 After that Tyler went to his going away ceremony and I went to Meadowbrook Mall in Clarksburg with the baby. I wasn't going to the ceremony because we thought it was outside. I spent the day at the mall where Tristan learned he could pull things off the shelves and racks. As I headed back toward the hotel Tyler called and told me he wanted me at the ceremony. I was only 10 minutes away so we went. The first thing I noticed about the place was how many people there were. Then how unbeiveably hot it was. The ceremony was reletively short. Congressman Alan Mollohan spoke as did General Tackett and Governor Manchin. The longest part was that the Governor and the Honor Delegation shook hands with every soldier. Tyler can be seen here with 50 seconds left in the video on the bottom left corner in front of the WV flag. He can also be seen (better view) with 2 seconds left in the right bottom corner. Yesterday was goodbye. The bus picked the guys up at the hotel. Tristan and I told Tyler goodbye as he left for Fort McCoy WI. I barely cried! This was all God because I'm a huge crier. I cried in Star Wars: Revenge of the Sith. I think it was that I know I'll see him again before he actually goes to Kuwait. I think I'll really loose it then.